Terahertz technologies utilize electromagnetic radiation in the frequency range between 300 GHz and 10 THz. Potential applications for terahertz technology in biology, chemistry, medicine, astronomy and security are wide ranging. THz wavelengths have several properties that could promote their use as sensing and imaging tool. There is no ionization hazard for biological tissue and Rayleigh scattering of electromagnetic radiation is many orders of magnitude less for THz wavelengths than for the neighboring infrared and optical regions of the spectrum. THz radiation can also penetrate non-metallic materials such as fabric, leather, plastic which makes it useful in security screening for concealed weapons. The THz frequencies correspond to energy levels of molecular rotations and vibrations of DNA and proteins, as well as explosives, and these may provide characteristic fingerprints to differentiate biological tissues in a region of the spectrum not previously explored for medical use or detect and identify trace amount of explosives. THz wavelengths are particularly sensitive to water and exhibit absorption peaks which makes the technique very sensitive to hydration state and can indicate tissue condition. THz radiation has also been used in the characterization of semiconductor materials, and in testing and failure analysis of VLSI circuits. Many of these applications require spectral selectivity. However lack of tunable sources and detectors necessitates the use of complex methods (e.g. heterodyne detection) or bulky optical components for frequency selection. Despite their impressive responsivity levels, conventional THz detectors are not tunable or suitable for portable applications. We work on transformative plasmonic device technology which could lead the first tunable direct detectors operating at room temperature. The proposed devices are micro/nano-scale semiconductor devices which can be easily integrated with semiconductor electronics. With their tunable resonant absorption characteristics, proposed plasmonic devices can also be used as very fast tunable filters for other THz detection methods. These advantages will pave the way for THz-spectrometer-on-chip. 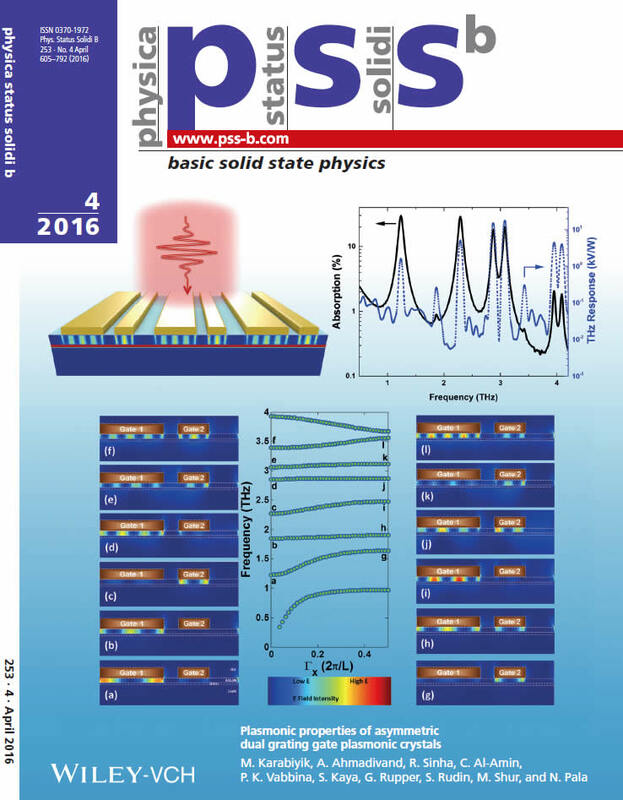 Our research also aims at thorough understanding of the THz electromagnetic radiation-plasmon interactions in complex FET structures which have not been fully understood yet and expanding our knowledge in the science of plasmonics. Analytical and numerical models developed and tested in our research will also help to create other novel devices such as tunable plasmonic THz sources, photomixers, and plasmonic crystals with nanoscale resonance elements such as quantum dots and plasmonic nanowires. Development of efficient coupling and conversion techniques for THz radiation can also make energy harvesting possible in far infrared and THz range of the electromagnetic spectrum which is currently not exploited as a widely available renewable energy source. micro-resonators with high Q factors. Meanwhile, nonlinear polymers have become increasingly powerful, with an r33, the standard metric of nonlinearity, of up to 263 pm/V has been demonstrated. It is expected that further improvements will be possible with r33 approaching 500 pm/V which is about one order of magnitude stronger than typical nonlinear crystals. Since the nonlinearity in these polymers are ultrafast, when combined with proper waveguiding and resonant structure design and adequate laser power, they can generate tunable CW THz radiation. The proposed devices will have the following advantages over the existing THz CW sources: i) tunability, ii) compact size, iii) room temperature operation, iv) no moving optics (filters etc. ), v) possibility of monolithic integration, vi) fast modulation. Zinc oxide (ZnO), a semiconducting material with piezoelectricity, high catalytic efficiency, biocompatibility, chemical stability in physiological environments and a high isoelectric point of about 9.5 is a promising candidate for bio-sensing applications. It has diverse range of nanostructures including nanoparticles, nanowires, nanorods, nanoflakes, nanoneedles, nanobelts, nanotubes, nanofibers, tetrapod-like and flower-like morphologies. High isoelectric point allows immobilization of most biomolecules without any additional biding layer. This provides a direct, stable pathway for rapid electron transport when an analyte is immobilized on ZnO nanostructure and improves electron transfer rate. We have developed a novel sonochemical synthesis method for various ZnO nanostructures. In comparison to the more conventional approaches for nanostructure synthesis, our method is not only significantly faster, inexpensive and performed at ambient conditions but also environmentally benign. The proposed biosensors would revolutionize continuous health monitoring with their high sensitivity, low cost and easy integration. hoc and opportunistic networking by offering solutions to its brittleness on mobility and line-of-sight alignment. Established on the same optoelectronics technology, solid-state lighting (SSL) (a.k.a. smart lighting) technologies are provably superior to the existing lighting technologies due to their durability and efficiency. SSL devices with multiple light emitting diodes (LEDs) are being heavily deployed and commercialized. It is expected that multi-element SSL devices will soon outnumber the traditional lighting technologies. The energy gains and long-term cost-efficiency possible with smart lighting devices are very attractive and urge further optimizations increase their potential gains. These devices have an additional advantage of fast turn-on and turn-off properties that could be leveraged for FSO communication. Though stemming from the same core technology, the SSL and FSO communication have inherent tradeoffs amongst each other. The lighting efficiency (e.g., illuminated area) is better when the divergence angle of the optoelectronic transmitter is high; whereas the communication efficiency (e.g., transmission range) is better when it is small. If such joint design challenges are tackled and tradeoffs are balanced well at the intersection of the two areas, there is a high-reward opportunity for expanding the scarce wireless spectrum to the large visible bands and a unique set of possible applications. We aim at investigating and developing multi-element “illuminication” structures that perform joint and adaptive optimization of these two conflicting goals: illumination and communication. Significance of our research lies in the holistic approach to develop a framework to design, optimize and test of illumination-communication systems considering needs and requirements for both functionalities. Our holistic approach is particularly important since we aim to explore multi-input multi-output (MIMO) communication with mobility. Such a joint-design approach with enhanced mobility capability is unique to our research. 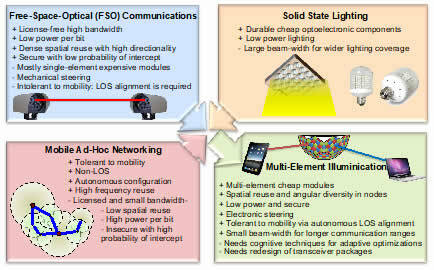 Novelties of the research include (i) joint design of illuminication modules with multi-elements (for redundancy) and spherical alignment (for spatial reuse and uniform illumination) considering both illumination and communication needs and constraints, (ii) adaptive intensity control for energy saving and chromacity control over red-green-blue (RGB) LEDs, (iii) transceiver design with varying field-of-view (FOV) and/or divergence angle, (iv) automatic realignment protocols (via electronic steering and focusing) for mobility, (v) cognitive algorithms for transceiver selection – similar to channel selection in cognitive radio, and (vi) optical wireless localization. NeTS:Small:Collaborative Research: Multi-Element Illuminication for Mobile Free-Space-Optical Networks, NSF CNS award# 1422062. THz plasmonic devices can be used for sensing and detection of biological and chemical substances in different modalities. The THz frequencies correspond to energy levels of molecular rotations and vibrations of many molecules including DNA and proteins and these provide characteristic spectral fingerprints for such molecules. 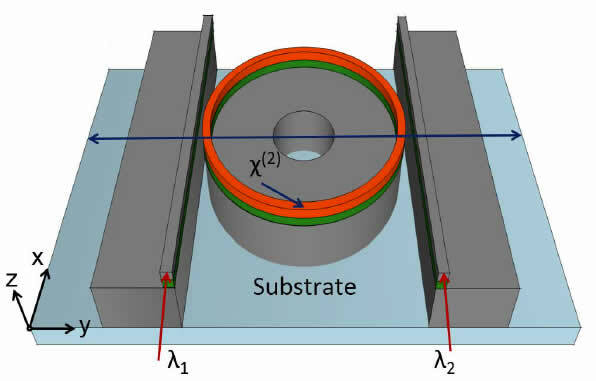 Frequency tunable THz plasmonic detectors can measure the absorption spectra of the substance of interest illuminated by a broadband radiation source without requiring complex and bulky frequency selection optics. Measured spectral absorption characteristics are compared to the database of spectral fingerprints to identify and quantify the substance. THz plasmonic detectors with integrated microfluidic channels can substantially improve the disease detection capabilities. Surface functionalization is commonly used method for sensing and detection of a variety of biological and chemical compounds such as DNA and prostate specific antigen (PSA) which can also be used with plasmonic THz detectors. Depending on the target molecule to be sensed, a probe molecule (an antibody) is anchored on the surface of the sensing device using chemical compounds such as thiol groups. Specific binding affinity between the probe and target molecules allow to capture only the target molecule causing changes in the surface potential as well as dielectric properties of the surrounding medium. 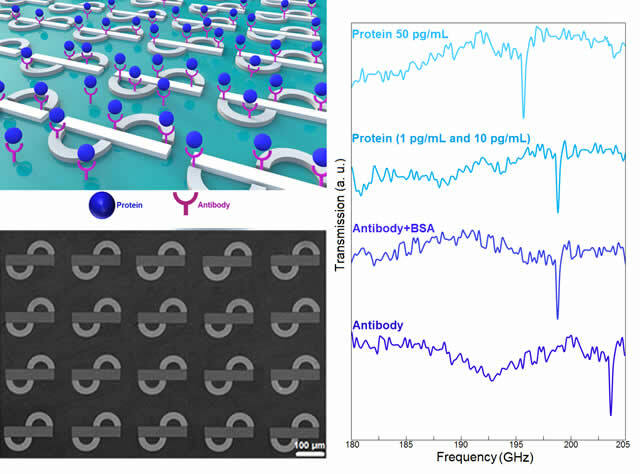 Both changes should change the response of the proposed plasmonic THz detectors allowing the sensing, detection and quantification of the biological molecules such as thiol-modified DNA strands and antibodies. immobilized on the surface of these resonators, their spectral response changes with the varying concentration of the biomarkers as they are selectively bind to the antibodies. Rapid detection capability combined with the very sharp resonance and easy fabrication of THz resonators compared to its counterparts in optical frequencies make these devices a promising platform biochemical sensing applications particularly for infectious disease biomarkers such as virus proteins. In this research, we design and fabricate different planar plasmonic nanostructures to investigate their toroidal modes and explore their biochemical sensing capabilities. Graphene, a monolayer of sp2-bonded carbon atoms in a honeycomb crystal lattice, has attracted considerable attention due to its unique electrical and optical properties. Intrinsic graphene is a semi-metal or zero bandgap semiconductor and it’s unique electronic properties produce an unexpectedly high opacity for an atomic monolayer, with a startling absorbance ratio of 2.3% of white light. Electrical characterization has shown a remarkably high electron mobility at room temperature, with experimentally reported values in excess of 15,000 cm2V−1s− 1. The corresponding resistivity of the graphene sheet would be 10− 6 Ohm−cm, less than the resistivity of silver, the lowest resistivity substance known at room temperature. The graphene also has extremely high saturation density of electrons and holes; a sheet electron/hole density on the order of 1013 cm-2 can be easily obtained, which is more than one order of magnitude higher than that found in conventional semiconductor materials. Due to its exceptional electrical property, graphene has been attracted for future electronics such as ballistic transistors, components of integrated circuits, transparent conducting electrodes and an efficient sensor. Graphene has a high electron (or hole) mobility as well as low noise characteristics, ideal properties for the channel in a FET. Its 2D structure, when combined with its excellent electrical property and low noise characteristics, makes graphene an excellent sensor – its entire volume is exposed to the surrounding, making detection of adsorbed molecules extremely efficient. The high electrical conductivity and high optical transparency make graphene a candidate for transparent conducting electrodes, required for applications such as touch-screens, liquid crystal displays, organic photovoltaic cells and OLEDs. Despite many attractive features above, however, there exists some critical obstacles that have so far prevented the graphene from being implemented into electronic device applications. One is that the pristine graphene does not have band gap that is essential for switching and transistor operation. The gapless energy spectrum of graphene is obstacle for creating transistor digital circuits based on graphene-FETs due to the nature of ambipolar behavior and relatively strong interband tunneling in the FET off-state, resulting in poor on/off ratios. Creating the band gap in the graphene electronic structure has therefore been one of the central research efforts. The other obstacle is the synthesis of high quality large-area graphene and its integration with other conventional and novel 2D materials to realize application in various fields. IN this research activity we work toward to develop new techniques that would enable systematic control of electronic structure of graphenes. Specifically, demonstrate that the band gap of graphene can be created and controlled by placement of nanoparticles on a graphene and/or creation of nano-scale holes (antidots) through electrical perforation. We fabricate and test graphene field-effect transistors to demonstrate their superior performances, including high on/off ratio and high speed and investigate the THz and sub-THz absorption and emission characteristics of the synthesized band-gap controlled graphene layers and explore their potential for THz oscillator applications. On the other hand, Vanadium dioxide (VO2) is a phase change material (PCM) (also referred as metal-to-insulator transition (MIT) material) which behaves as an insulator at room temperature, but undergoes a phase transition to metallic state when heated above ~343 K due to reorganization of its molecular structure. In such phase transitions (switching), its electrical resistivity can be varied from 0.1 Ω.m to 3×10-6 Ω.m, in a few nanoseconds by using either electrical stimulation or optical excitation. We recently, developed a VO2-based reconfigurable antenna platform with individually-controlled microheater pixels. We use an indirect excitation mechanism to change the electrical resistivity of VO2 through metal-to-insulator phase transition by transferring the heat generated within the resistive heater to the VO2 layer. In this scheme, electrical stimuli are only applied to the microheaters, not directly to the PCM. By taking the advantage of this technique, we show that a planar antenna placed on a 9×9 microheater matrix can be configured into different patterns with the operating frequencies in S-band (2-4 GHz), C-band (4-8 GHz) and X-band (8-12 GHz) which cover the entire Ultra Wideband (UWB) spectrum (3.1 to 10.6 GHz). A New Route Toward Systematic Control of Electronic Structures of Graphene and Fabrication of Graphene Field Effect Transistors, Department of the Army — Materiel Command Award # W911NF-12-1-0071.